Custom clothing is an investment of your time and money and you should be rewarded with amazing fit, gorgeous garments, convenience, and compliments. Before you invest either of those valuables with a local custom tailor, be sure you ask these questions. Will I be able to see many finished pieces for inspiration? If this is your first piece of custom clothing you may be overwhelmed by the number of fabrics and styling options and trying to visualize them in a completed garment – especially if the fabric swatches are small.Even custom clothing veterans will be inspired by the latest fabric patterns, pocket styles, contrast buttonhole, and thread colors, just to name a few. Be sure your custom tailor has enough recently finished garments on display so you can properly visualize the final garment you are spending hundreds or thousands of dollars on. At Nicholas Joseph we have a full showroom complete with thousands of fabrics and dozens of finished garments on display with the latest styling options and designs. Do the jackets come with working cuff buttonholes? Working, or functional, buttonholes on jacket cuffs should be standard for custom suit jackets, sport coats, and blazers and there should be no additional fee for this. The creation of working buttonholes on a jacket takes additional time, respect for quality, and most importantly, measurement and tailoring experience. You should also be able to select a contrast color for the thread for no additional fee.If your jackets do not come with functioning buttonholes, you should question the quality of the garment you are purchasing since the actual manufacturer of the garment doesn’t seem to think the quality of the garment deserves functioning buttonholes. At Nicholas Joseph, functional buttonholes (aka Surgeon's cuffs) have always been included in the cost of the jacket or suit. In common practice, custom clothing prices are based on the quality of fabric used in the garment, as well as the overall construction of the garment. Custom tailors know that the nature of custom clothing is such that the garment is custom made for each client, complete with client-appointed styling options. If you are working with a custom tailor that charges you additional fees for lapel, collar, cuff, pocket, vent, or other styles (not fabric or lining upgrades), you should question the quality of the garment and the custom clothier. At Nicholas Joseph our pricing is all inclusive of design details, functional buttonholes, and other options. Premium fabrics and linings are available for an upgrade. Where are the garments made? Your custom tailor should have USA, and preferably locally made custom garments available to you, should your budget and preference allow.Many custom clothing shops will offer custom suits at different price points, from entry level overseas made, to locally made bespoke.Due to advances in ‘Automated Mass Customization’, a whole boom of individuals called “custom clothiers” sell Chinese Made to Measure clothing, often with little or no training on measuring and fitting – the most important aspects of the custom clothing experience. While the quality of the Chinese made custom clothing has grown to be impressive, the experience and availability of the team behind your custom experience, from the Designer to the local Master Tailor is of utmost importance. At Nicholas Joseph we offer three distinct "makes" of custom clothing in order to accommodate varying taste and budget: Made in Chicago Bespoke, Made in USA (Knoxville, TN), and Overseas. We stress the importance of having a team approach and locally made custom clothing available as an indicator of the seriousness with which your custom tailor approaches fit and quality. At Nicholas Joseph we have a full team of Designers and Master Tailor to guarantee satisfaction, can expedite alterations on site, and keep your updated paper pattern on file for easy future orders. NEW: Custom Polo Shirts for Spring & Summer! Collar: Classic Ribbed Polo style, Stiffer Collar for pairing with Sport Coats, same fabric or contrasting Sleeves: Short or Long sleeve, same fabric or contrasting Fabric: Classic 100% Pique Cotton or Jersey Knit Contrasting Fabrics: Available for Inner collar, placket, sleeve, pocket piping, ringer sleeves, and much more including dozens of button choices. 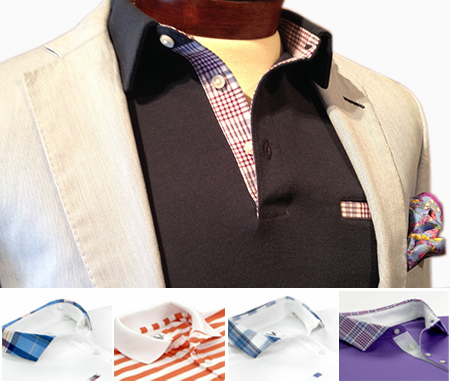 Request an appointment today, custom polos are delivered in approximately 4 weeks.